Bent Wing Flight Services will take over as KFHB’s only FBO beginning April 1, and move into a new terminal in June. The FBO will provide its full array of services out of a temporary terminal until that time. Fernandina Beach Municipal Airport was built during World War II by the U.S. Navy for training the F4U Corsair airplane—one of the Navy and Marine Corps’ finest fighter planes. The Corsair was known for its inverted gull wings, making it highly-recognizable in the sky and earning it the moniker “the Bent Wing Bird”—the namesake of the FBO. In further reverence to its military background, the new general aviation terminal was designed to represent the Corsair aircraft, complete with inverted gull wings, a nose section, skylight cockpit and tail. The interior will feature a two-story glass lobby with a model F4U Corsair suspended from the ceiling, and military and historical memorabilia displayed throughout the building. The plans for the new terminal have ensured that its historical design meets modern-day function, providing all the necessary amenities—a pilot lounge and shower, flight planning room, conference room, canteen coffee bistro and pilot store—to complement Bent Wing Flight Services’ array of offerings, including full fuel services, concierge services, courtesy and rental cars, catering services, hangar space and after-hours service. 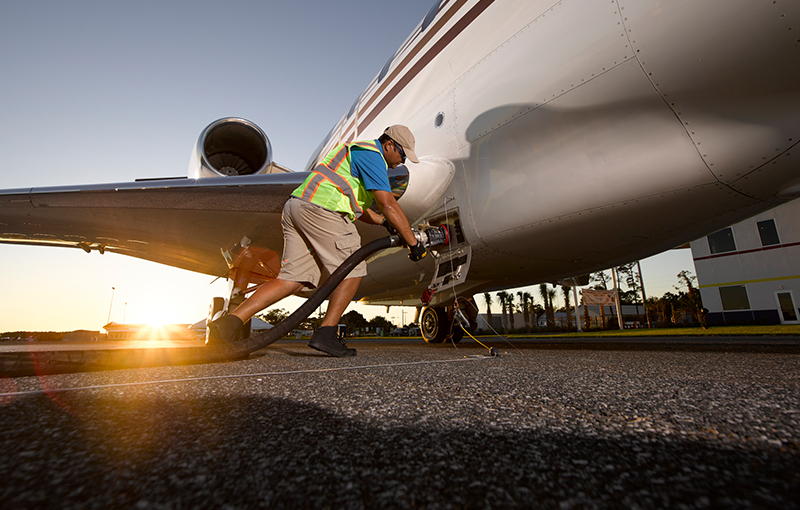 As an Avfuel-branded FBO, visitors to Bent Wing Flight Services will benefit from competitive fuel prices through Avfuel Contract Fuel and lucrative rewards through AVTRIP. Bent Wing Flight Services is Fernandina Beach Municipal Airport’s sole FBO, offering the aviation community full, professional services for a first-class travel experience at KFHB. Honoring the airport’s military roots, the FBO will operate out of a brand-new, F4U Corsair-inspired terminal as a beacon of the spirit of aviation and its contributions to our country. Avfuel provides fuel and services to the global aviation industry and is the leading independent supplier in the United States. Established as a supply and logistics company more than 40 years ago, Avfuel is core competent in every aspect that surrounds the delivery of fuel – from refinery to wingtip. Avfuel combines global access with personalized service throughout a fueling network of more than 3,000 locations worldwide and 650+ Avfuel-branded dealers. Our 100% dedication to aviation demonstrates our passion and commitment to a global community that prospers on the movement of goods and services around the world.